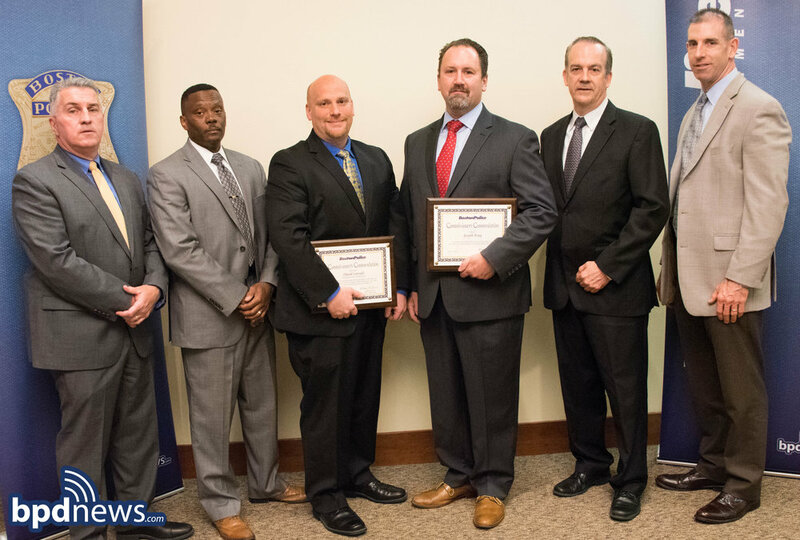 Today, May 31, 2018, Boston Police Detective Joseph King and DEA Investigator David Carvelli received commendations for their investigation into the fraudulent use of prescription medication pads from a local hospital. Detective King and Investigator Carvelli were able to identify a former hospital employee as a suspect, a time frame when these fraudulent prescriptions were processed, and a list of doctors whose DEA numbers had been compromised. They also identified twenty-five additional individuals who had passed fraudulent prescriptions on stolen prescription pads. The resulting partnership between the Boston Police Department and the Drug Enforcement Administration resulted in thirteen suspect identifications, and a grand jury convened. As a result of the grand jury investigation, eleven of the thirteen individuals were indicted and each charged with violations of Massachusetts drug laws. Detective King and Investigator Carvelli were able to stop the filling of these fraudulent prescriptions, preventing the drugs from reaching the streets of Boston, and for this they are each awarded a Commissioner’s Commendation for their excellent work. Also awarded a Commissioner's Commendation today was Homicide Analyst Jennifer Bencivenga for her part in the swift capture of a suspect responsible for a shooting homicide earlier in 2018. Ms. Bencivenga has been an integral part of the BPD Homicide Unit for nearly eight months and continues to provide invaluable support to the unit in their investigations. For this she is recognized with a Commissioner's Commendation.